Sell and buy parts, vehicles, or anything else you may think of! How many times is your vehicle out of service because of a part that’s either on back-order or very expensive? 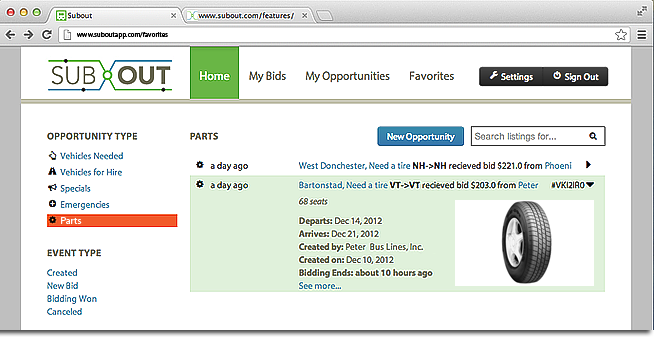 With SubOut.com, find hundreds of operators that carry spare parts. Why pay full price or wait an extra day and lose thousands of dollars in charter income, when SubOut.com can help you do business faster and cheaper? Just post your needs on SubOut.com and find solutions that fit your schedule and budget. Favorites are companies from either your private network or other members of Subout.com that have exceeded your expectation and that you would like to work with again. These companies can become part of your list of Favorites. When you create an opportunity for bid, you may choose to limit the group of bidders to your Favorites list. If a trusted member of your network is not currently a member of SubOut.com, it may still become part of your list of Favorites. Simply send their email address to the site. The Favorite will be receive a welcome email with instructions about creating a Guest account that will grant limited access to the Subout.com – now your trusted colleague can bid on your work through SubOut.com. For full access to bid or post Guests need to become members of Subout.com. To see Favorites in action, click on the video below. Breakdowns are a nightmare no more! If you are broken down in an unfamiliar area, use SubOut.com to ask other members for road-side service, locate a hard-to-find mechanical part, or just another bus to get your passengers to the nearest rest area.